Quickly shrink your images, add thumbnails, and create the code for a web gallery alongside. With an emphasis on image quality. Because you don't want your shrinked images to be blurry and lose detail. Preview everything before you export: File sizes, compression, even thumbnails. Highest quality output. Highest level of control. Free to try – Download now and see the difference! Wolfgang Ante, developer of SUPER RESIZE. 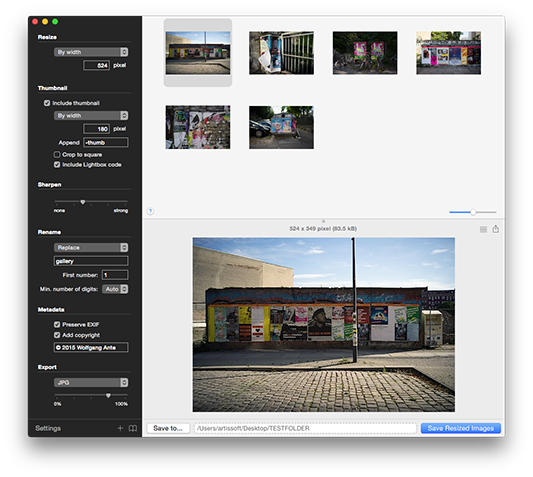 Super Resize uses advanced algorithms to keep your images crisp. Gradually blend the result with a sharpened version to show the details even better. Super Resize uses the GPU to render your resized images. This adds extra-speed and finishes large batch exports in shorter time. Generate thumbnails automatically. Crop them to square if you want to, so that a web gallery looks tidy and neat with all same-sized thumbnails. Fully color-space aware resizing. Convert or keep the color space of your images. You decide! Keep the EXIF metadata of your source images in your resized images – or not. You choose, not the resizing app. Generate code for a web gallery. Paste it into your source, add free Lightbox code + your own CSS, and you're ready. Preview your resized images before exporting. Output quality, file sizes, and even thumbnails. Change settings and see the changes apply immediately.